Not much is better than getting to ride your bike on a beautiful day. Except for getting to share that ride with the ones you love! Bicycle trailers are the best way to allow children to stay up to speed with their parents, providing a safe and exciting opportunity to tag along on all the family adventures. Know what to look for in the best bicycle trailers for optimal fun and safety. Most parents have experienced the often frustrating nature of supposedly transportable children’s items, like pack ‘n plays and strollers. When choosing a bike trailer, find one that will make your life easier – not more difficult – with simple setup and takedown. Not only will you want something that can be easily hooked and unhooked from your bike, but you also want something that can be stored and moved with the few clicks of a button. Not all bike trailers on the market offer the same capabilities. Some bicycle trailers focus solely on being good with bikes, and there’s nothing wrong with that. Still, some bicycle trailers aim to fit the needs of families always on the go and are multi-functional, morphing from bike trailer to stroller (or more) and back. If versatility is an attribute you find useful for your family’s activities, find a trailer that can accompany you no matter what the plan is. When you have your children in tow, you’re carrying your most precious cargo. 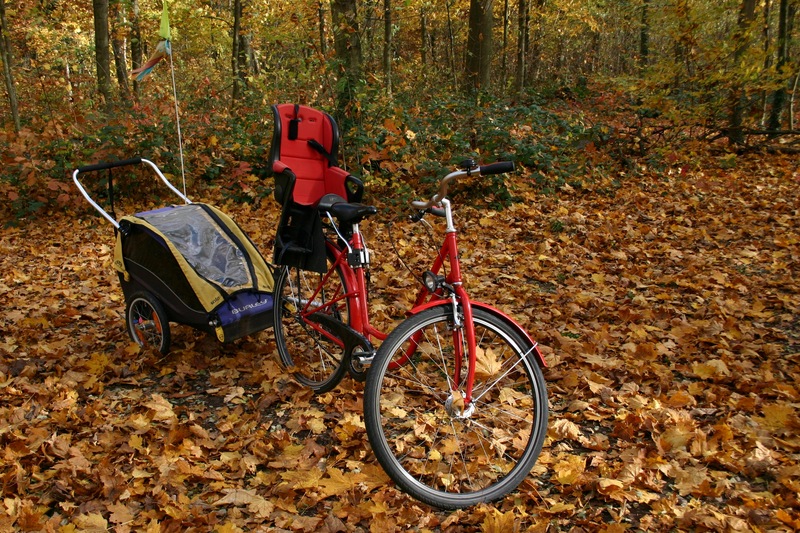 Make sure you find the bike trailer that puts any unease you may have about safety to rest. Most trailers offer features like red safety flags and bug screens, but some go above and beyond. Weather shields, brake systems, and foot guards are all elements that may provide superior safety needs for a stress-free ride. 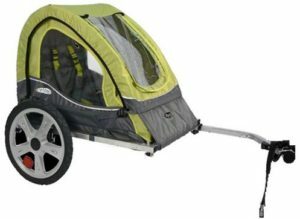 This Pacific Cycle InStep trailer is perfect for one little passenger. 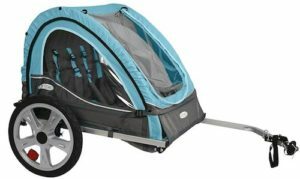 It has an internal harness for safety with a two-in-one canopy that includes a bug screen and weather shield. It folds down simply and has quick release wheels for take-down, so adventures can start outside of your neighborhood. If one is good, two is better, right? This InStep trailer is double the fun with room for two passengers up to 40 pounds each. It fits almost any bike and comes with all of the features of the single bike trailer but weighs about five pounds less. If your child isn’t interested in just enjoying the view but wants to take part in the adventure too, try the WeeRide Co-Pilot bike trailer. The WeeRide acts just like a bike with a wheel and pedals, but the handlebars don’t steer and parents have complete control. 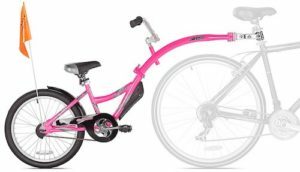 It has a safety flag and padded handlebars; it’s recommended for older children, ages four to nine and holds up to 75 pounds. The Aosom Elite is another trailer built for two, but this towing device has a three-in-one design. 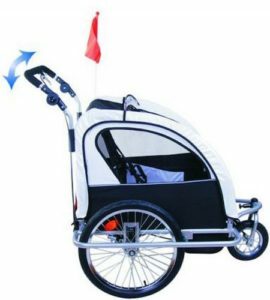 The trailer can be transformed to function as just that behind a bicycle, as a stroller, and as a jogger. It fits every family outing need. It also has nice safety and control features like a locking swivel front wheel, full suspension, and a hand-lock brake system on the back wheel. 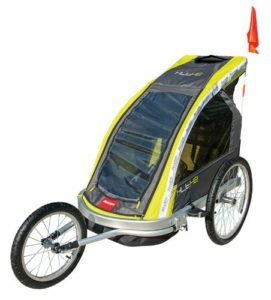 The Allen Sports trailer is another great option for variety, switching between trailer and jogger with a few quick release buttons. Its design also affords a few luxuries that other designs lack, like the rear storage pocket, tinted side windows, and a foot guard tube that adds protection for the little ones’ feet.